Study Abroad programs are becoming increasingly attractive as more and more college students seek meaningful ways to spend college breaks or explore the true diversity of cultures. As a result, not only has a great international program become more expensive but also a lot more competitive to get accepted into First and foremost step - Talk to parents, teachers, current students abroad as well as alumni to evaluate if you would be interested in studying abroad. Contact an education consultant who is looking into study abroad applications to understand what is best for you, how you should plan your timeline of standardized tests and applications to colleges abroad. Remember to study hard for your standardized tests (SAT, SAT Subject Tests, ACT, TOEFL, IELTS and so on) and register well in advance. Plan your test dates well so you have time to retake if required. It is important to build your student profile with project work, summer internships, extra-curricular activities and volunteer work. If you know the industry you are looking to get into, network with people in this industry to understand job trends and skill set required to enter the industry as it well helps you in selecting programs and schools for applications. Shortlist universities with your education consultant and carefully evaluate the available options criteria such as offered programs, rankings, location, campus life, eligibility, scholarship and financial aid opportunities. Some destinations like the US and the UK are well known to international students but the picture is changing and new study abroad destinations are making headway. Some destinations like the US and the UK are well known to international students but the picture is changing and new study abroad destinations are making headway. While researching a college, it's imperative that you do not make rankings your foremost criterion. You need to get started early and make the official college website your Bible. Spend time in figuring out how the information you have garnered from websites/ brochures becomes significant to your academic goals and personal growth. Invest time in looking at the different kinds of majors the college offers, core requirements aka core curriculum, the combination of majors and minors and opportunities to gain practical exposure by means of study abroad or student exchange programs. College is your oyster and its diversity and size are important factors as well. Large colleges usually have more resources like academic concentrations and majors, research facilities, faculty, culture, entertainment, etc. Small colleges mostly specialize in liberal arts education and the overall experience is usually more intimate. Smaller classes really do tend to weave a closer-knit community, but large classes bring with them diversity and a larger set of niche opportunities. Though college is a great time to explore the new and unknown, a drastically different environment can be sometimes jarring. Do you want to live in a big city or somewhere little quieter? It is also important to consider how different the weather will be from what you are used to. For example, if you are the kind of person who wants beaches and the sunshine the year round and a cocoon of pulsating city life, UCLA or NYU would be the ideal college for you. On the other hand, if you are a fan of snow and a contained campus far away from the city, look at Middlebury College or even Vassar College. More important than the overall rankings would be the reputation(s) of the department(s) in which you might choose to major. You can also get an idea of the SAT/ACT range of most of the schools on the ranking list to determine whether a college/university would be a realistic choice for you based on your own scores. Alumni give you a glimpse into the ethos a college fosters and allows you to judge which college resonates more with you and your career goals. If a school has enthusiastic alumni, they can help students find internships or even jobs. One way that school choice can affect a person's career path is through career planning opportunities offered by the college. Other factors may be more important to you personally, but in the end, the cost may trump them all. Private schools are usually more expensive than public colleges and state universities. However, private schools tend to have larger endowments and offer more grants and scholarships. You have probably heard it many times before, but remember that what you are looking for will be the best "fit" for you, and that is an individual choice. Talk to students, alumni and possibly professors from the institutions you are considering to acquire an understanding of what you might be getting yourself into. Accordingly, gauge whether you would be interested in pursuing the option further. Next, talk to your parents and make your goals and plans clear to them while explaining to them the details, merits and demerits of the programs. You and your family need to take a hard look at yourselves financially and ascertain whether you will require external financial assistance or not. Now that you are firm on studying abroad, you need to strategize. For this, find an educational consultant who understands you and your goals and is committed to helping you realize them. The ideal counselor will give you a comprehensive understanding of the application process, help you identify the best institutions for you, and assist you with the preparation of a timeline for standardized tests (SATs, GRE, GMAT, LSAT, TOEFL, IELTS and so on) and essays. Prepare well for the standardized tests but account for the time that may be required for a second or third attempt (with high costs, you should look to avoid them as much as possible). Essays are a crucial component of the application and you will need time to write and perfect multiple drafts. Universities abroad seek holistically developed individuals, so you are going to need a lot more than just good test scores and recommendations. You will need to start building your profile from a young age by pursuing your strengths and interests. A typical profile includes project work, summer internships, extra-curricular activities and volunteer work. If you already know where you want to go professionally, you could also start networking with individuals in the industry to understand the skill set required to succeed and begin working on developing those skills. 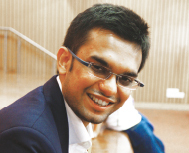 Rohan Ganeriwala is the Co-Founder at Collegify. They help students to study in abroad by helping them in funding and scholarship opportunities. Collegify provides quality personalized services that make a student college ready.